The MSU Fall Kickoff Celebration, coordinated by Staff Senate, is Wednesday (Aug. 17), the evening after convocation. Join your counterparts on campus from 5 to 7:30 p.m. for food, live music, children’s games and fun. Food service will be south of Hartnett Hall from 5 to 7 p.m. The event is free to Minot State University faculty and staff and their immediate families. The rock wall in the Wellness Center will be open, but all climbers must sign a waiver and climbing belts will need to fit. A cupcake walk begins at 6 p.m. There will also be a prize wheel and prize drawings including one-night stays, free rounds of golf, movie tickets, Medora Musical tickets, apparel and more. For questions about the MSU Fall Kickoff, contact Mindy Rudnick, Staff Senate president, at mindy.rudnick@minotstateu.edu or 858-3176. Convocation activities continue Thursday (Aug. 18) at 9 a.m., with informative minisessions. They include http://www.minotstateu.edu/pio/attachments/2016/2016-17%20fall%20convocation%20mini_sessions.pdf. Employees are encouraged to attend as many sessions as possible. For questions, contact celeste.simmons@minotstateu.edu or 858-3310. On July 20, the North Dakota Higher Education Challenge Fund Grant Review Committee awarded $480,000 in matching grant funds to Minot State University. In 2015, the North Dakota Legislature made $22.6 million available to enhance North Dakota University System institutions through matching grant funds. MSU has secured a total of $1.4 million in challenge grant funds. The POWER Center, a TRiO-Student Support Services program, is offering an in-depth, pre-university orientation course through Friday (Aug. 19). This orientation prepares a select group of first-year students for their university experiences. “During this week we hope to diminish students' anxieties about being new to campus and help them be well prepared for a successful experience at MSU,” said Holly Major, program director. The POWER-eligible students moved into their residence halls to spend six nights and five days on the Minot State University campus immediately prior to fall semester’s start. Participants will learn about resources MSU and Minot offer. They will also connect with peers and become equipped with the tools and essential university knowledge that will lead to personal and academic success during their higher education endeavors. Presentations will cover financial planning and include mock lectures. To read the full news release, visit http://www.minotstateu.edu/pio/news/2016/08/power-center-plans-in-depth,-pre-university-experience.shtml. A new seasonal air-supported multisport dome, currently under construction at Minot State University’s Herb Parker Stadium, will soon provide the greater Minot community and region year-round access to the stadium's artificial turf field. The nearly $1.9 million air-supported dome will be erected in November and removed in late April or early May. Paid for by non-university funds, including a $1 million Community Facility Fund grant from the City of Minot and another nearly $900,000 privately raised, the seasonal dome enables the turf to be utilized for a number of additional events, such as weekend tournaments in youth, adult and collegiate soccer and softball, and non-tournament usage, such as MSU softball, soccer, baseball and football, area schools soccer, softball, baseball, football, public walking and jogging, community events, Minot Recreation Commission activities, a golf driving range and more. For questions, go to http://www.msubeavers.com/news/2016/8/10/general-construction-on-air-supported-dome-at-herb-parker-underway.aspx. To provide arts programming in its community, the North Dakota Art Gallery Association was awarded a $7,690 Institutional Support grant by the North Dakota Council on the Arts. The grant will enable NDAGA to foster the public’s appreciation and understanding of the arts, organize a support network for rural and urban art communities, provide common services for organizations engaged in cultural activities, and sponsor cultural performances and fine arts exhibits. NDAGA, a nonprofit corporation promoting growth in North Dakota arts activities since 1975, provides professional training while coordinating exhibitions, information and services for gallery and museum personnel. Administered by a board of nonprofit gallery representatives, it is headquartered in the Minot State University Art Department and overseen by Linda Olson, MSU art professor chair and NDAGA executive director. To read the full news release, go to http://www.minotstateu.edu/pio/news/2016/08/north-dakota-art-gallery-association-receives-arts-grant.shtml. In addition to numerous writing and teaching exercises during the Northern Plains Writing Project Institutes at Minot State University, participating teachers read and discussed Thomas McCann’s book “Transforming Talk into Text” and Mel Silberman’s “Active Learning.” Both books offer educators new avenues for teaching writing skills across a wide swath of students, from middle school to university. The learning, however, comes from more than books. NPWP is part of the National Writing Project, an organization dedicated to art of teaching and improving student writing and learning skills. NPWP’s teaching model is based on the premise that teachers learn best from other teachers — sharing successes and pitfalls of genuine classroom teaching experiences. 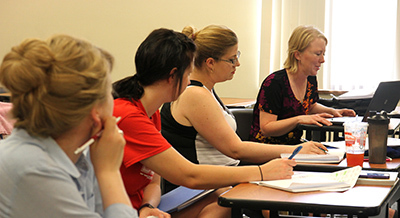 “As a teacher, I feel I learn and grow tremendously each summer thanks to the institute,” Rachel Maxfield, Minot, said. Minot State University welcomes new employee, Andrew “Andy” Carter, director of athletics. Carter joins Minot State University after serving as athletics director at Northwest Oklahoma State. He has 26 years of experience in collegiate athletics and 18 years as an athletic director. He earned a bachelor’s degree at Missouri Baptist University, St. Louis, and a master’s degree at Lindenwood University, St. Charles, Mo. Carter and his wife, Rena, have been married for 31 years and have six children and six grandchildren. Jolene Nechiporenko, Gordon B. Olson Library purchasing manager, completed a master’s degree in library information science in December through San Jose State University.